This prefab has been archived by the uploader because it is out of date and no longer supported. We recommend you browse the file list for the latest prefab. Allows full upgrades for all armors and helmets. Tested with the latest AO, STCoP and OWR. Gotta give credit to Team Epic for there awesome work, and since this addon is based on their outfitt upgrade file. Full details for the addon are in the file. Have fun. Tired of chosing what to upgrade? Do you fell sad everytime you take an upgrade when you wanted both? Then this addon might just be for you. 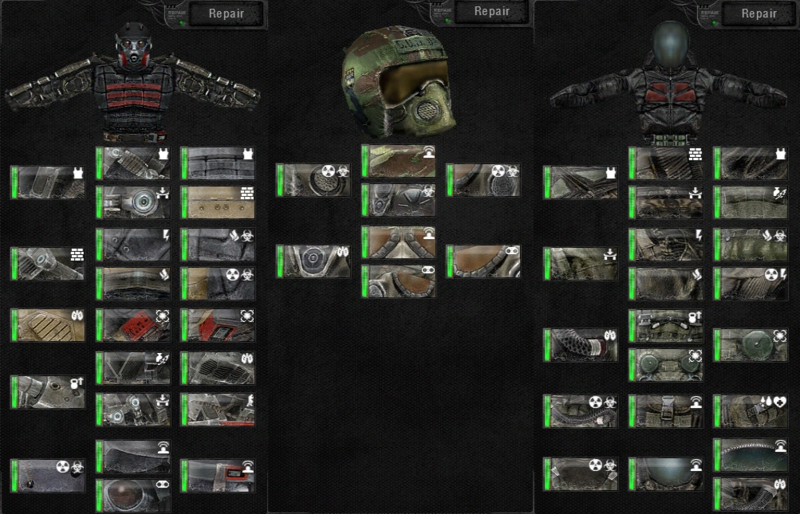 Allows full upgrades to both armor and helmets. Tecnicians still require toolkits to upgrade. Second tier upgrades cannot be fully upgraded with basic and fine tools only. For that you will need the full set of tools. Nothing I can do about that. Foresteer works as intended. Compatible with AO, STCoP, OWR and more outfitts addon. Saved games will only work if you dont have upgraded outfitts or helmets in them. If you do have upgraded outfitts or helmets, then I sugest starting a new game. Copy and paste the gamedata file into your CoC directory. It should not overwhrite anything, unless you have custom made outfitt upgrades or if you have unpacked gamedata. I did not test it with OWR nor STCoP. However it should be easy enough to tell. Just go to gamedata/configs/misc and if there isnt a outfiit upgrade file in there, then I assume that this is compatible. Will this be compatible/included in the to be released update? Compatible? Yes most likely. I did not test this on the next update beta files, but I assume this will work since outfitt upgrades are rarelly modified. If for some reason this doesnt work on the next update, I will update this. It wont be included in the game itself, but as an optional addon ofc. I hate dilemmas, so I welcome this, thanks. I welcome your welcoming. Again, if any issues pop up fell free to report them here. Does this work with outfit addon????? The helmet in the middle of the thumbnail is from outfitts addon. Say WHAT about weapon upgrades?! The words I have can't describe how excited I am right now. I could just explode into a ball of Shashlik, then that ball of shashlik would explode into Vodka. I have a question but digression,why helmets(third NV upgraded) nignt vision still got first NV effects? I honestly didnt check that. As I only changed the upgrades schematic and sequence. The efects remain the same as they always were. Still I can take a look and see whats up with that. Hey again. So I checked the night vision upgrades and everything seems fine there. I dont even understand how you can tell the diference between night visions, cause in AO they all look the same to me. Anyways, i did a couple of changes to the battle helmet upgrade tree since having 2 NV upgrades is useless. Switched the 2nd G. Nv upgrade to a 3rd G. Nv. And the previous 3rd G. Nv upgrade is now a infrared scanner. In other words, this helmet is OP as ffffff after upgraded now. This change will be updated soon here and will be optional for the player installing. I think I found the problem that causing this, I noticed the author of the AO giving a wrong name for the nightvision screening effect. rename them by just remove the alphabet "g"
Just remember rename them without the alphabet "g" behind the number. i think you are refering to stcop weapons pack ppe files cause the new ao doesnt have anny altho i cant get my night vision to work with the radiation suit ,i can upgrade to gen2 so i gues it has to have nv :? Yes. This doesnt change the toolkit treasure hunt. You can either find them or you could go to the red forest. If your interested in a upgrade tree unlock, theres an addon in the last page of the addons that gives you just that. No problem in asking m8. THANK YOU SO MUCH FOR THIS! Ive been looking for A mod like this For ages Now, And its finally Here. Little question though Is this mod Compatible With the Zero Weapon and Armour Degradation - AO3 Mod? I believe so yes. Since those two mods you mentioned should only modify the outfitts and weapon files. This addon changes the outfitt_upgrade, so no compatability problems. Does That Mod works with your Full upgrades for weapons aswell? Also does your 2 mods work with warfare? the all weapon upgrades and this one? Im pretty sure they work with warfare. I didnt test it, but its easy to assume that since warfare doesnt change the outfits anf weapons upgrades. As for the zero weapons degradation combined with weapon upgrades. That depends. If you install the base files only of the weapon upgrades, then yes itsbfully compatible. If you alsow install the optional bolt sniper upgrades, then those files will replace some weapon files "snipers". By replacing these files, it will overwhrite the zero degradation in those weapons. So not fully compatible in that sense, but it should be easy to merge. Works with 1.4 as far as i can tell. so does the full weapons upgrade. They work but the values arent acurate since 1.4 had some calibration to the actual upgrade values. You can use this for the time being, but a more acurate version will be released in the future. Thank you finally someone has done this, I asked for this when the CoC just came out but no one knew wtf i was talking about. When is a new version for 1.4 coming out? Mind if i make my own full outfit upgrade mod? Or somebody else already did it? im currently downloading AO 3.1 for COC 1.4.16 and i wonder if there will be an update for that. Is This Going To Get Updated? Is compatible for call of misery?